Jonathan Lee was born in Kuala Lumpur, Malaysia in 1974, and now lives in London. Whilst reading law at Bristol University he studied with Sidney Griller, subsequently taking up a place at the Royal Academy of Music in 1997. At the Royal Academy he studied with Howard Davis, and graduated in 1999 with a distinction for the two-year Postgraduate Performance Course. In recognition of an outstanding final recital he was awarded the Lesley Alexander Award and the Diploma of the Royal Academy of Music, the highest discretionary postgraduate award. Jonathan has also studied privately with Barry Griffiths and David Takeno. Jonathan is now a freelance violinist in London. He is on trial for a 1st violin position with the Royal Philharmonic Orchestra, and plays regularly with the Glyndebourne Touring Opera and the English Symphony Orchestra (where he is a member as no.3 2nd violin). He has played with the BBC National Orchestra of Wales and the Welsh National Opera. 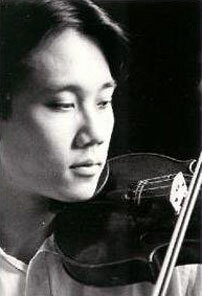 As a soloist and chamber musician, Jonathan has performed in England, Belgium, France, Malaysia and Singapore. In Singapore, a reviewer said Jonathan `impressed with his virtuosity and musicality’. He has performed Elgar’s Introduction and Allegro with the Philharmonia Orchestra as well as Mendelssohn’s Octet with Philharmonia principals. As a student, Jonathan’s orchestral experiences included principal 2nd violin under the direction of the late Lord Yehudi Menuhin and as co-principal under Sir Colin Davis.